As promised, HMD Global has started the rollout of stable Android 9 Pie update to the Nokia 7 Plus. This news was announced by Juho Sarvikas, Chief Product Officer at HMD Global on Twitter stating ‘Everybody wants a piece of the Pie! We are starting the rollout of Android 9 on Nokia 7 Plus. Which of its delicious new features is your favourite?” The update is slightly delayed as at the launch event of Nokia 6.1 Plus and 5.1 Plus last month, the Finnish upstart company stated the Android 9 Pie update would be rolled out to the 7 Plus in the first half of September. But recently, Sarvikas confirmed that they ran into some certification issues which caused the delay. Nevertheless, the stable update rollout has just started and it will reach your Nokia 7 Plus in the next few days. Juho Sarvikas did not reveal how they’re rolling out the update, whether it’s a staged rollout or a complete rollout. Usually, smartphone brands release updates in a phased manner so that if the received users confirm any bugs, they’ll halt the rollout, fix them and begin the rollout again. Maybe, HMD is also following the same, but I did receive the stable Android 9 Pie update weighing 1471.3MB on my Nokia 7 Plus. Do make a note that am registered on the Nokia’s Developer Preview programme. So if you’re a Nokia 7 Plus user, head over to Settings>System>About Phone> Check for Update. The update comes with the version number 3.22C. Once you receive the update, wait for the installation to finish. Since the Nokia 7 Plus supports seamless updates, you just have to wait for the installation to complete; It might take 15 minutes for the process to finish. Once it finishes, just reboot your smartphone. 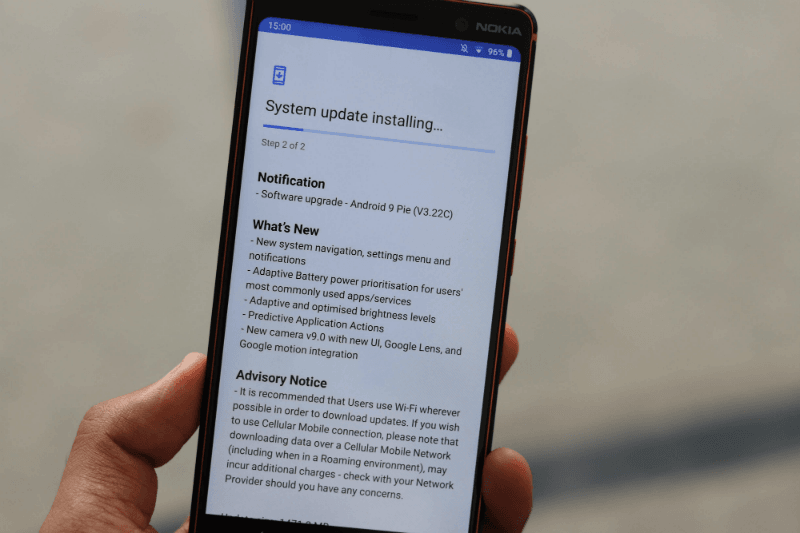 OTA method is the only way you can install the update on your Nokia 7 Plus as HMD never releases fastboot ROMs of their phones. Let us know in the comments section below whether you’ve received the update on your Nokia 7 Plus or not. Since the Nokia 7 Plus is an Android One smartphone, it boots stock Android without any customisations. As we have seen in the earlier Developer Preview versions of Android 9 Pie, the 7 Plus has all the features which Google introduced. According to Google, Android 9 Pie is all about Artificial Intelligence. Features such as Adaptive Brightness, Battery Life, everything is now based on AI, meaning the phone will learn your using habits and adjusts the settings accordingly. Android 9 Pie also comes with revamped quick tiles, new gesture navigation, entire new Settings application and new animations. It also adds features such as App Actions and App Slices. App Actions adds two cards on top of the app drawer and these cards will be based on AI as well. To know more about App Actions, head over to this article. In the future, features such as Digital Wellbeing and App Slices will be added. Why you need to mention Airtel?